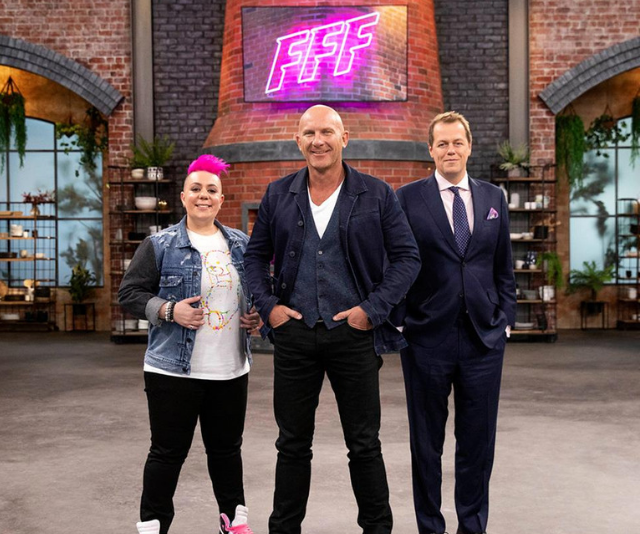 Anna Polyviou has been making our mouths water with her incredibly creative and delicious desserts for years, and now she's having a ball putting Aussie home chefs to the challenge as a judge on Family Food Fight. But which desserts does she make at home? For Anna, food was always a passion. Growing up she spent a lot of time in the family kitchen and remembers fondly having her hand slapped away from the cake mix as her mum prepared to bake using the Kenwood blender she still uses to this very day. 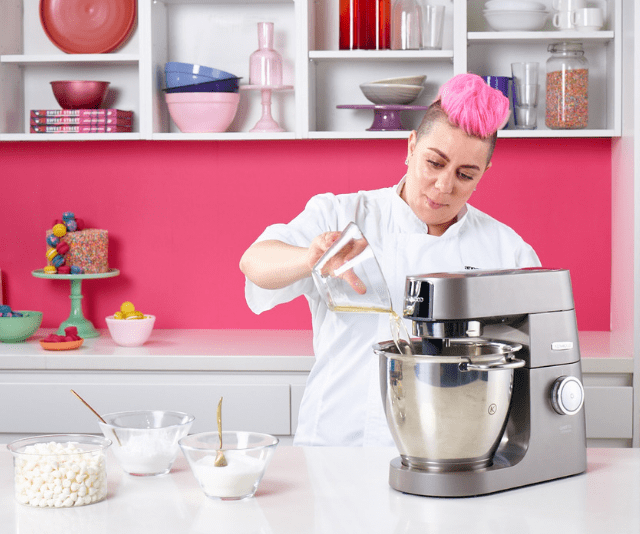 It's perhaps no surprise then that Anna has not only gone on to become a dessert legend in her own right, but also an ambassador for Kenwood, the appliance she has grown up using and still proudly has on her own kitchen bench at home. While the cooking she learned at home set her in good stead, it wasn't until Anna was reluctantly entered into a competition during her apprenticeship years that she truly discovered her passion for desserts. "I had no idea how creative it could be," Anna tells Now To Love. "Ever since then I have always thought outside the box when it comes to creating desserts, I want to make a point of difference and grab people's attention." And that she does, the 38-year-old's creativity and intricate recipes are the stuff of legend, and she took some time to share a few of the tricks she learned along the way, including one very surprise secret ingredient she can't live without. 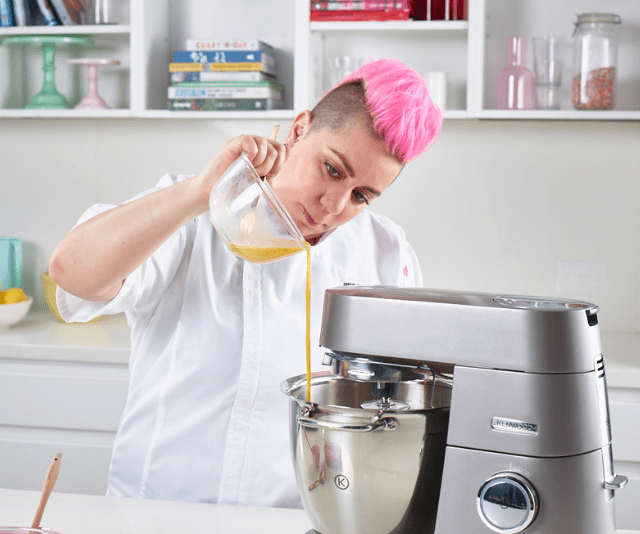 Read the chat we had with the Family Food Fight judge, dessert queen and Kenwood ambassador Anna Polyviou below. Dessert is such a treat, but there's probably a few of us who just cheat and go for a bowl of ice-cream! Is that you too? What's your favourite simple and quick treat? "Oh I love ice-cream too," laughs Anna. "I can't get enough of sorbet, it's really simple to make yourself using fresh fruit when you want a sugar fix. Custard is also a favourite in my house." Oh I imagine dessert time is super-fun at your place! What are the items in your pantry that are the staples for whipping up the tasty treats you're so famous for? "My pantry is so organised. Up the top you'll find all the healthy ingredients … then there's my dessert shelf," says Anna, the creator of the famous 'Firecracker dessert'. "On that shelf you will always find vanilla pods, I never use vanilla essence only pods, then good quality compound chocolate for cooking with and sea salt flakes which I use in nearly everything. "There is also good quality honey which I use to replace sugar sometimes, you can make a delicious burnt honey caramel which I love to do … how long have we got? I could talk about desserts all day!" laughs the bubbly chef. "Oh, fresh fruit and a good natural yoghurt, if you have those a sweet treat is never too far away too. "And there's something else you will always find in my pantry, it might surprise you, but I use them a lot … it's Lolly Gobble Bliss Bombs! You can smash them up and use them in biscuits and cakes, and then pile on top at the end, there a limitless ideas about what you can do with them and I tell everyone that!" Ah, really? That leads me into my next question then. I think every Aussie parent has sent their child to school with a bunch of cupcakes for cake-days or a child's birthday – you got any tricks for making our cupcakes stand out from the crowd? "Yes! Lolly Gobble Bliss Bombs," laughs Anna. "I'm not joking, you can step up a regular cake to the next level by folding them through and baking them in, then piling more on top once they're done. I'm telling you – everyone loves them. My Kenwood Chef Xl Titanium has a folding tool which makes blending them though the mix so easy too." Oh that sounds good, is that the appliance on your bench at the moment? "It is," says Anna. "And I expect it to be for a long time too. My mum still has the very same Kenwood she's had her whole life. They really last that long. "I love mine, my favourite feature is the halo light. It lights up the bowl so I can see the texture, consistency and colour of the mixture. Also, there are bowl tools included with the machine too. My Whisk Bowl Tool works overtime in my kitchen. The unique Folding Tool is also incomparable – I know Kenwood spent a long time getting this right so it mimics the folding motion." So it sounds like you are making desserts at home as much as you do at work! What's your go-to to whip up when you're entertaining? "I love to make desserts in glasses because I can prepare ahead of time and leave them to chill. Mousses, panna cottas that sort of thing. I'll top them with fresh fruit or meringue and crisp it up just before serving. "Although we had friends over recently and they begged for me to make cupcakes, so I did … but I suspect that request was just so my partner could lick the bowl!" Anna laughs again. You've been testing out home chefs on Family Food Fight, I'd love to know if any of the families have wowed you with their desserts so far? What's been your favourite dish to taste? "Oh I know! But it's coming, you haven't seen it yet, so you'll have to wait," Anna divulges. "It was so simple too, but oh my God, it was incredible. I went back into the kitchen after tasting and ate more, we all did – the crew and everyone. I even took some home in a takeaway container it was THAT good. There was nothing complex about it, which proves that simple really sometimes is the best." Family Food Fight screens at 7:30pm, on the Nine Network.